StockMarketEye can download current quote data for stocks, ETFs and mutual funds from most major world exchanges. 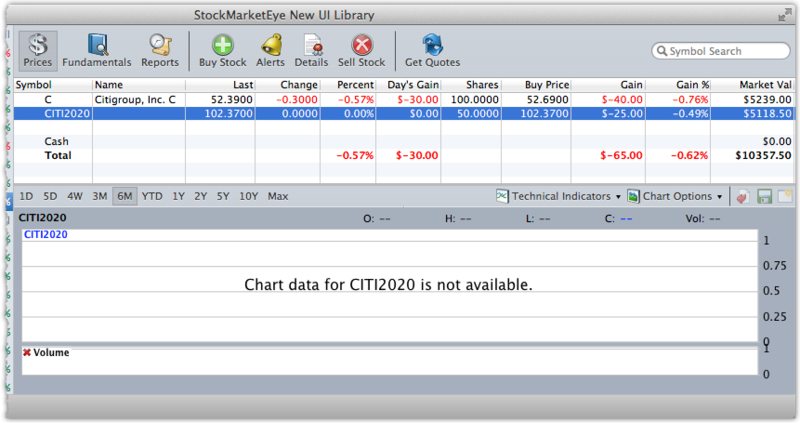 It can also download current quotes for currencies and US stock options. However, for some securities, StockMarketEye may not have access to current quote information. Securities such as bonds and preferred stock as well as items such as real estate will not have quote data available. You can still include these securities and investments in your StockMarketEye portfolios. The following can be applied to any non-quoted security or investment. Choose a ticker symbol to represent the item in your portfolio. You are free to choose any ticker symbol you want. We suggest choosing one that will easily remind you of the investment it represents. The ticker symbol you choose must not be a recognized ticker symbol that is used for an actual security. 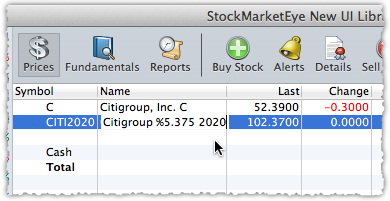 You can verify that the chosen ticker symbol is not already used for an actual security by entering it into the “Symbol Search” box in the top-right corner of the StockMarketEye window. If there are no Search Results found, that ticker symbol can be used. 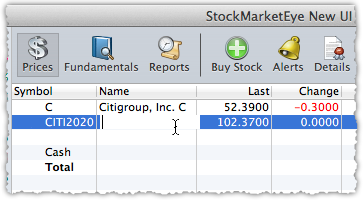 Use the chosen ticker symbol to add an item to your portfolio, as you would with a normal stock. 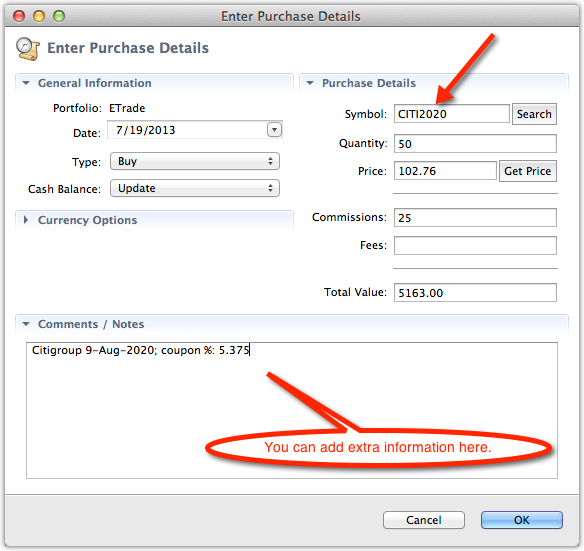 Click on the “Buy Stock” button in the toolbar to open the “Enter Purchase Details” window. Then enter the chosen ticker symbol and other pertinent data such as the quantity of shares and current market price. You can add extra information about the item you are adding in the comments field. Click OK to add the item to your portfolio. StockMarketEye will display a warning that it does not have access to any data for this symbol. We can safely click OK as we will enter the current price ourselves. Your portfolio will now look something like the next image. 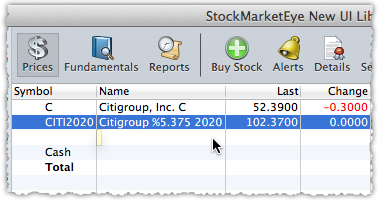 We’ve also added a holding of Citigroup’s publicly traded stock, C, to the portfolio for comparison. (Optional) Notice that the “Name” column is empty for this item. You can add your own name by editing the “Name” field. See the section, Changing The Name Of A Security, for more details on editing the Name field. To do this, select the item and then click in the “Name” cell of that line as shown in the next image. Then type the name you want to give this item. 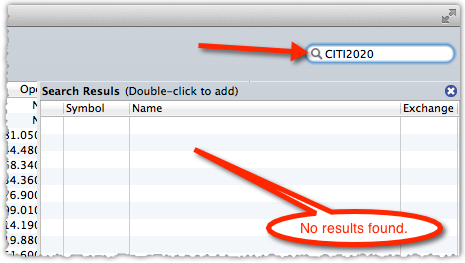 In this example, we’re using “Citigroup %5.375 2020”. When you are done entering the name, press Return to have StockMarketEye remember it. Update the “Last” price of the item to the current price. 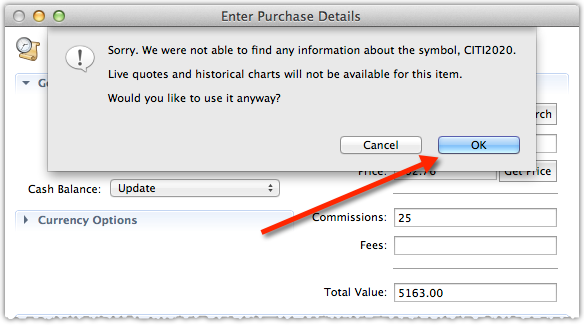 StockMarketEye won’t be able to update the price automatically, but you can set it manually. See the section, Overiding The Last Price, for more details on editing the last price. To do this, as in step #5 above, edit the item’s “Last” cell, entering the current price. StockMarketEye will then recalculate the value of the holding based on the price you enter. Note that the asterisk next to the price denotes that this item’s “Last” value has been set manually. You can update the “Last” cell in the same way any time you want to bring your item’s value up-to-date.